Thank you to everyone who has continued to vote for me in Project Run & Play! If you like this week 3 look, please take a moment to vote for Call Ajaire: No Scrap Too Small here before Thursday night. I recall this story one of my mother’s friends told us when I was in high school. There was an older lady who had passed away and as her family was going through her sewing things they came upon bins of fabric. One bin was full of teensy scraps and was labeled “too small to use.” We all got a big chuckle out of that. I think about that woman all the time and how she couldn’t bear to part with even the scraps she declared too small. 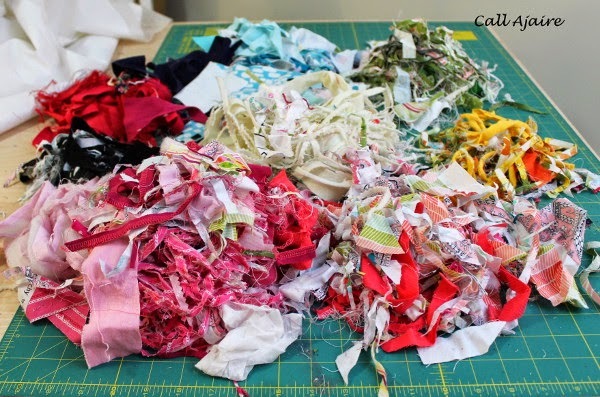 As someone who is a borderline fabric hoarder I can completely relate. To a scary degree, hehe. 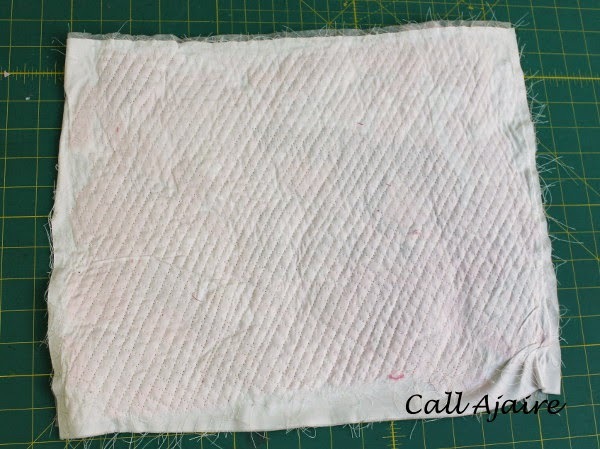 For those of you who quilt especially, you know how hard it can be to toss out the small bits that result from squaring up your blocks or for cutting triangles. 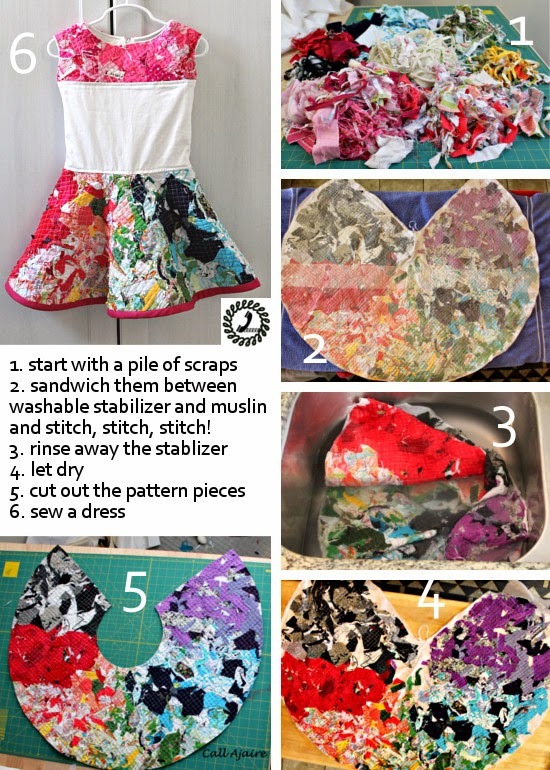 Well this project is basically a way to use every last piece of your fabric. It started with an idea I had after watching an episode of Under the Gunn where I was going to try to use some tulle as a sort of netting to hold scraps down on a piece of muslin. I was working out the plan in my head when my good friend Amy sent me this pin. And it was PERFECT. 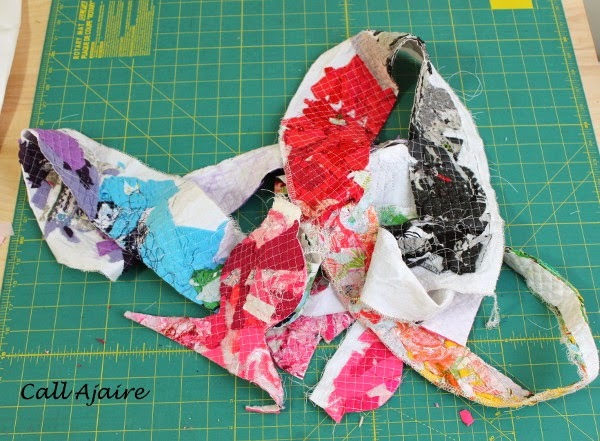 Without the tulle layer all the scraps would be free to shine on their own as their brightly colored selves. I started with a big piece of muslin that was about 3 inches bigger than my skirt pattern piece on all sides. I put two pieces of wash-away stabilizer over the muslin and basted along the outside edge. Then I stuffed all the scraps under the stabilizer through overlap of the two pieces. For the skirt piece I stuck to a blended rainbow pattern. 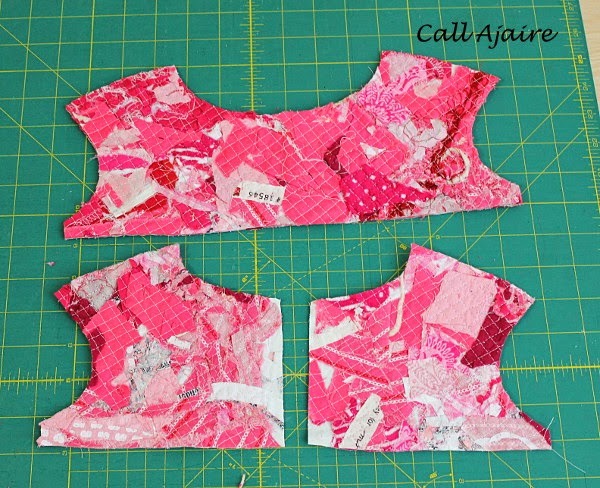 For the bodice pieces I used only the pink shades of scraps. Once everything was where I wanted it to be I pinned a few spots and brought the whole thing carefully over to the sewing machine. Then I stitched through the layers in a small grid pattern. I used 3/8 inch so the squares would be small enough for the thread to keep everything held down. Even that piece of cording leftover from last week‘s headband made it into the mix and the stitching was enough to keep it firmly in place. 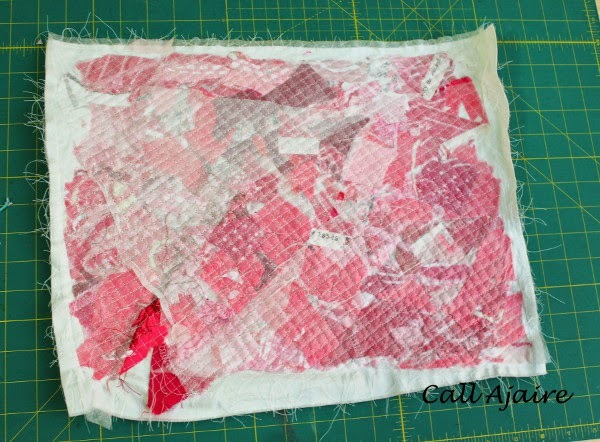 You can see on the back of the pink piece how the grid looks on the muslin side. Everything isn’t perfectly lined up, but it’s just right for this scrappy project. 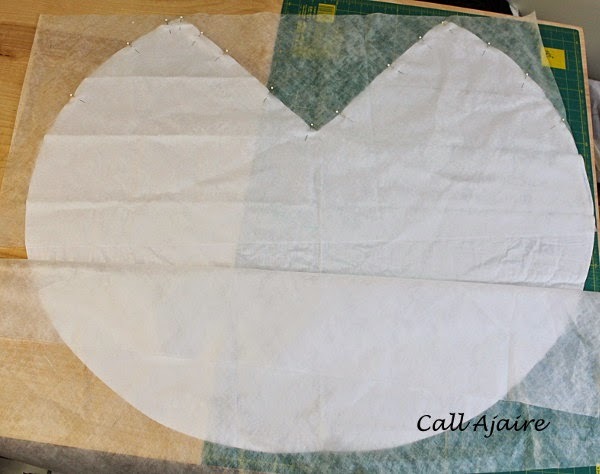 You could also do free motion quilting with this process which would be really cool. Once everything had been stitched it was time to soak the pieces so the stabilizer would dissolve. This part was so scary. I had already put in so much time and the project was down to the wire (I didn’t get the chance to start until Friday! ), so there was no time for it not to work. The stabilizer just melted away and after a couple of rinses I was left with just fabric. Luckily it worked exactly as I had imagined it would. In the picture above you can see how wet it still was, but the colors were so vibrant it was all I could do not to Instagram a sneak peek! 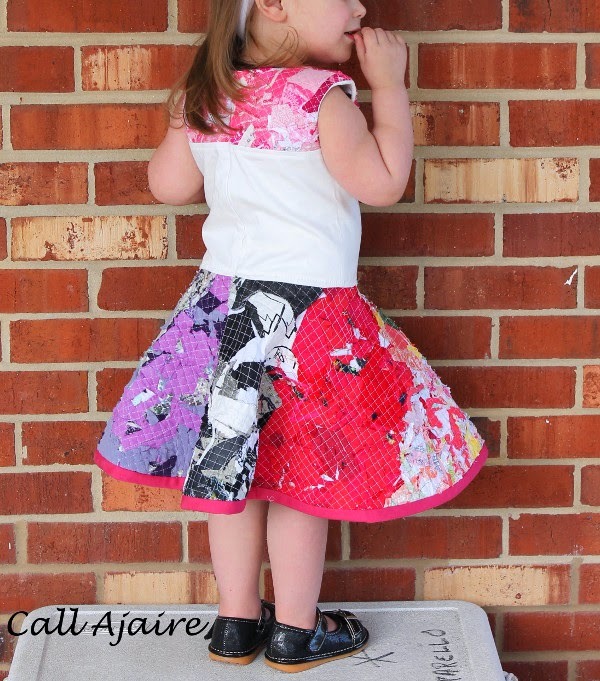 I just love seeing all of these fabrics I’ve used over the past few weeks. 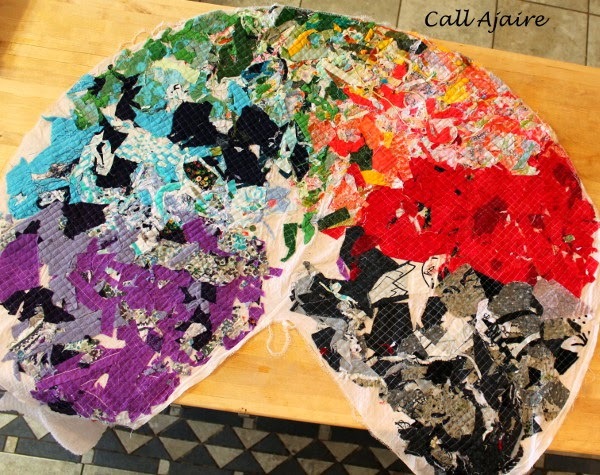 I think this would be a cool way to do an “i spy” sort of quilt too. It took a while for the fabrics to dry, so in the meantime I drafted the dress pattern. I used the skirt from the dress I drafted here and modified the bodice. I extended the bodice down so the dress would be drop-waisted and changed the armscye to allow for a faux cap sleeve instead of an inset sleeve. I then split the bodice horizontally at the under arm so I could use the pink scrap fabric for just the upper bodice pieces. 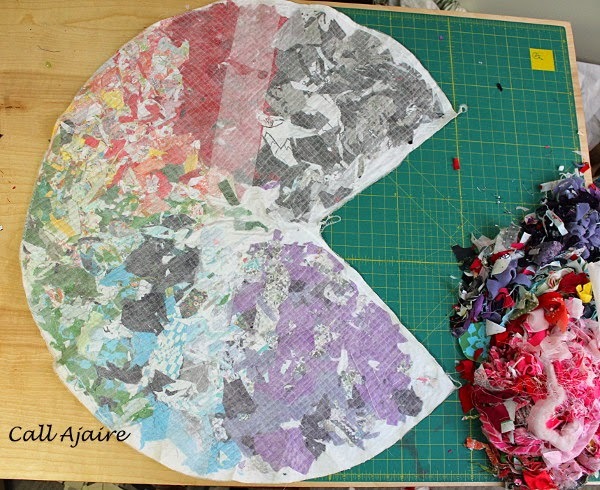 Once the fabrics had dried, I cut out the pattern pieces. The skirt looked so neat and I was really excited at this point. The weight of the skirt fabric is about the same as a heavy denim. The pink scrap fabric is much lighter since I didn’t layer it as much, but I wanted the skirt fabric stuffed with as many scraps as I could fit. The bodice of the dress is fully lined with the same fabric I used for the lower bodice sections. It’s a white stretch sateen which is one of my favorite fabrics. It has a subtle sheen to one side that I thought would fit nicely with all the bright colors of the scrap sections. I chose white so that the scraps would really stand out too. And since sateen is a bottom weight it really helps hold up the weight of the skirt. The sateen has a bit of stretch to it so the bodice is soft and Bean is really comfortable moving around in it. 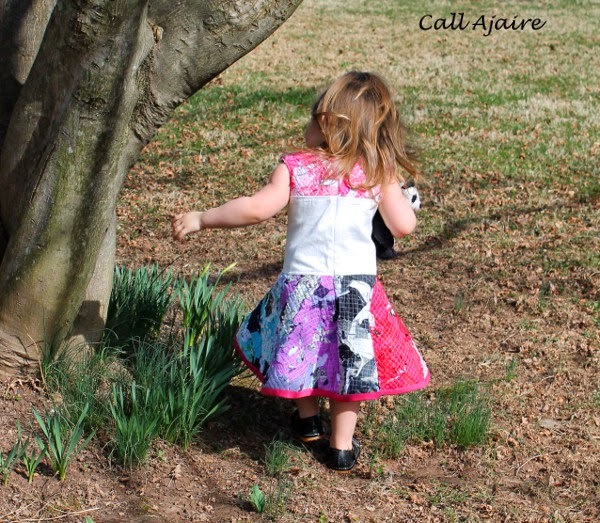 The skirt fabric is just heavy enough to maintain a great twirly shape, but not so heavy that it pulls at the bodice at all. I had hoped the daffodils would be up in time to take a pretty spring flower shoot, but the cold has stalled the bulbs a bit. We lucked out with a sunshiny day at least. Those daffodils will be blooming any day now. I love how a drop waist looks with her baby belly. 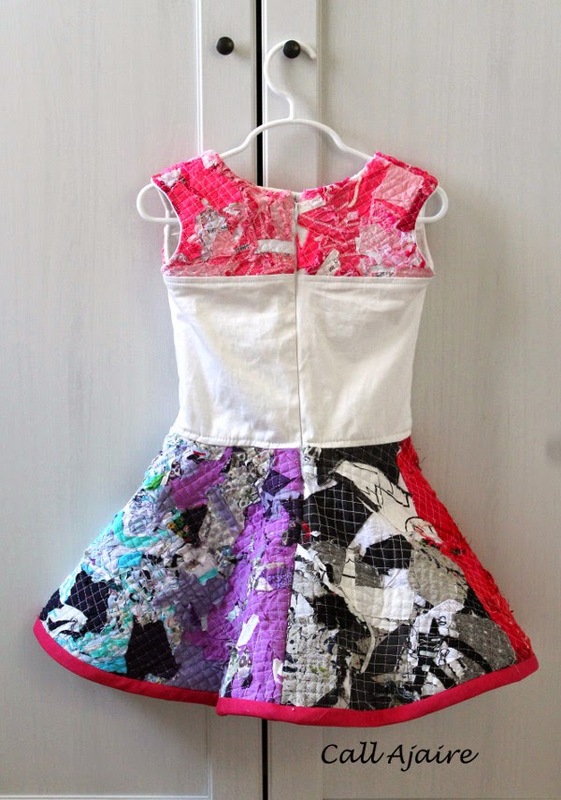 And the extended bodice should mean Bean can wear this dress for a while. 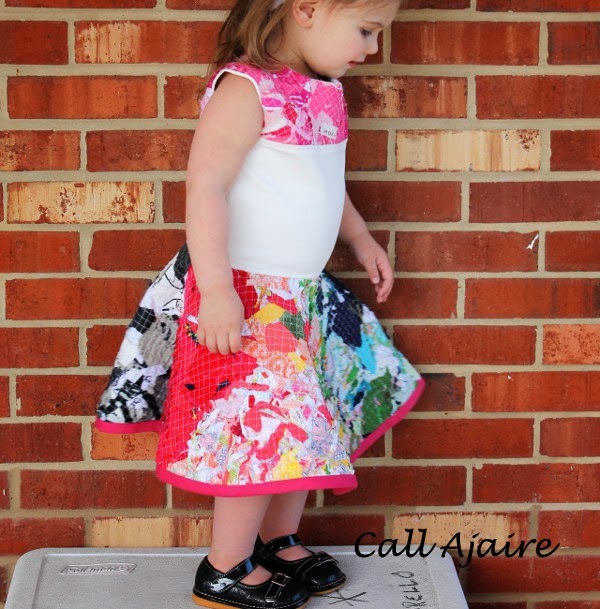 After all the work I put in creating the fabric I didn’t want her to outgrow it before the summer even gets here. The invisible zipper extends down below the skirt which will make it easy to get her growing body in there for some time to come. 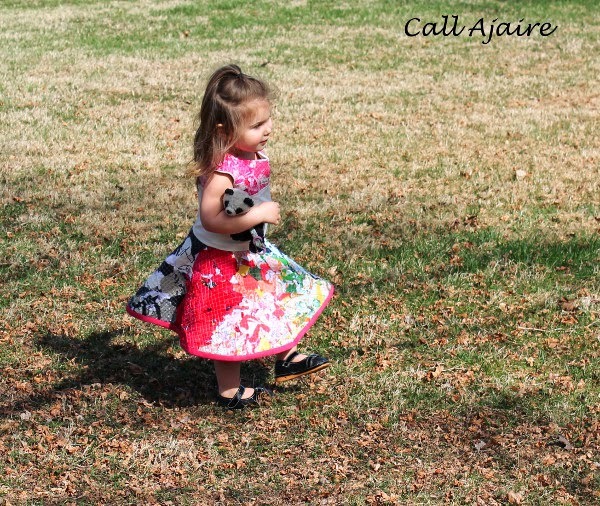 I was worried the bodice top and skirt edges wouldn’t line up well across the zipper, but I was determined to make sure she could wear this dress with ease. Everything lined up perfectly on the first try which really speaks to how easy this scrap fabric is to work with. Finally, instead of hemming the circle skirt I used my favorite method to make some double fold bias tape and bound the edges. The fabric is a cast-off from last week’s look. I bleach-dyed some red fabrics to try to get the perfect color for the capri pants and this attempt ended up too berry to be a Nantucket Red. It was just perfect for this dress and since I had modified the original fabric it fit in well with this week’s theme too. 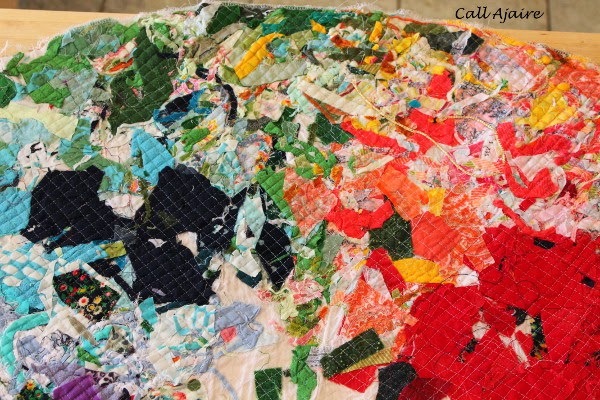 Now the real danger is when my brain starts cooking up ideas of what to do with these scrap fabric “scraps”, hehe. I am so pleased with how easily this whole look came together from concept to creation. 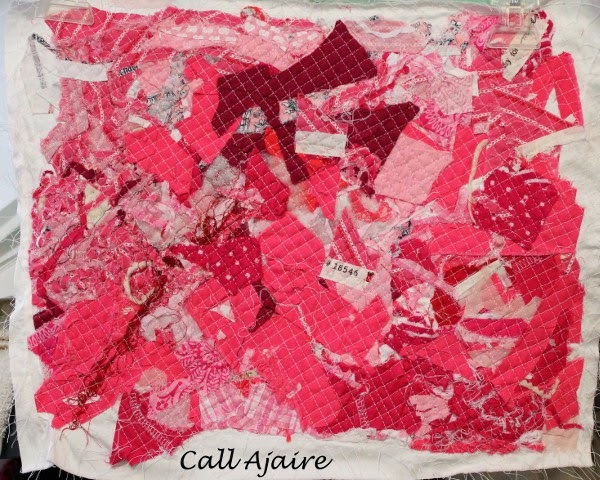 If you like how I interpreted this week’s theme please vote for Call Ajaire: No Scrap Too Small over at Project Run & Play through Thursday evening. It’d be amazing to make it through to the final three! Oh my goodness. I love this and it is so unique and creative! Fabulous job!! 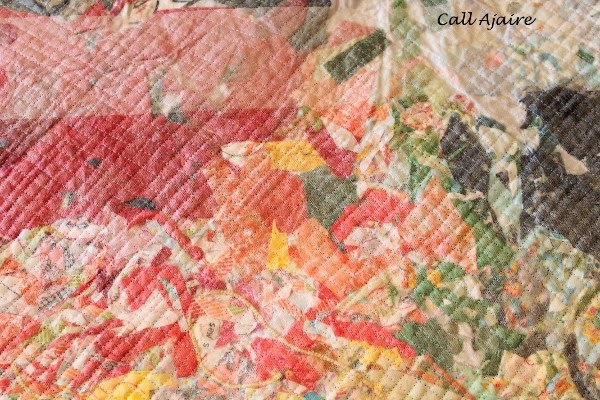 It's a good thing I don't bother to square up my squares when I quilt or I'd have way too many scraps. I love how it's like a water color and a collage rolled into one. Ajaire, this is phenomenal! Way to go!!! Raphaelle you have to try it! It's super easy (just takes time) and I know you'd do something so cool with it! Thank you Donna! I was so nervous when it came time to soak it, but it worked perfectly. Good stuff! Yeah I can definitely see the water color/collage thing too. I love seeing all the different fabrics in one place. You did a wonderful job of interpreting this week's theme! 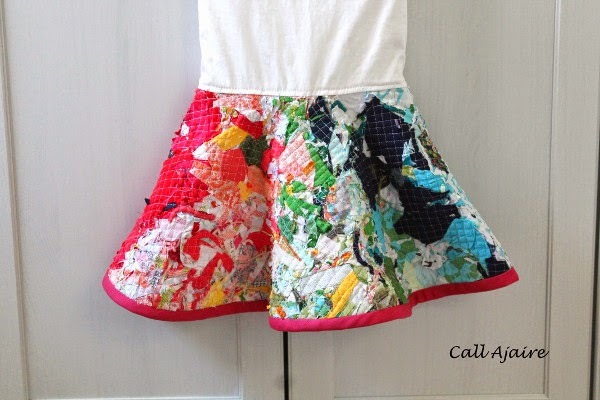 You actually made your own fabric using an idea that I have never seen before, and it turned out beautiful 🙂 It's actually more of a work of art than a dress … I love it! Wow!! This is very impressive!! 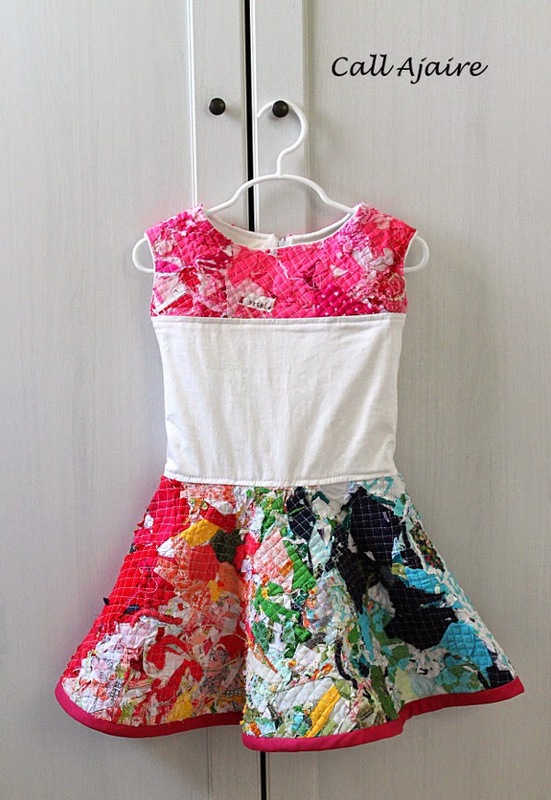 What a creative use of scraps and such an adorable little dress 🙂 Lots of luck this week!!! You are AMAZING, Ajaire. This is so beautiful. Ohmygosh, this is so incredible! I am in love – so much work put into this, and stunning results! This technique is going on my "want to try" list for sure! this is so awesome! Now I am going to want to keep ALL my scraps! That technique is awesome! I really need to try it! Really cool Ajaire! 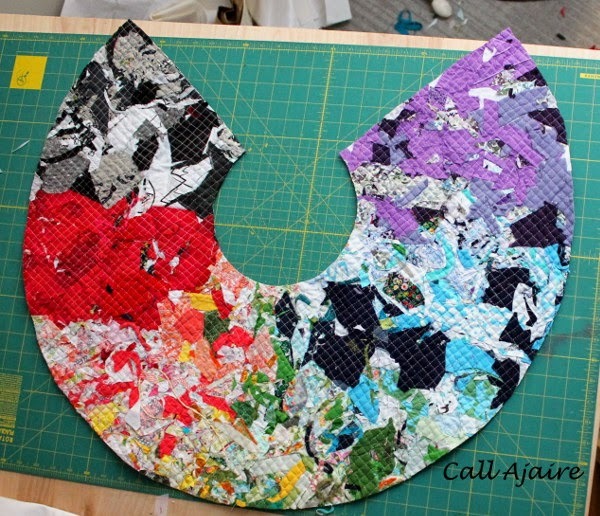 It is amazing to see how you used all those scraps. Awesome! I love the inspiration for this. How sweet, too small to use 🙂 The final product is beautiful! This is so cool! I love the dress and hope that you make it through to the final three. You got my vote! Wow, this is fantastic! I am so impressed! Thanks Meghan 🙂 I hope I make it through to the final. That's sweet shino! I hope you're feeling well? I can't wait to see what you do with it karly! This has got to be one of the coolest things I have ever seen! Oh my Ajaire, you were the only one who MADE fabric, not just design it. Although you were out this week – I was soooooo sad when I saw it =( know you were amazing, unique and nailed it. 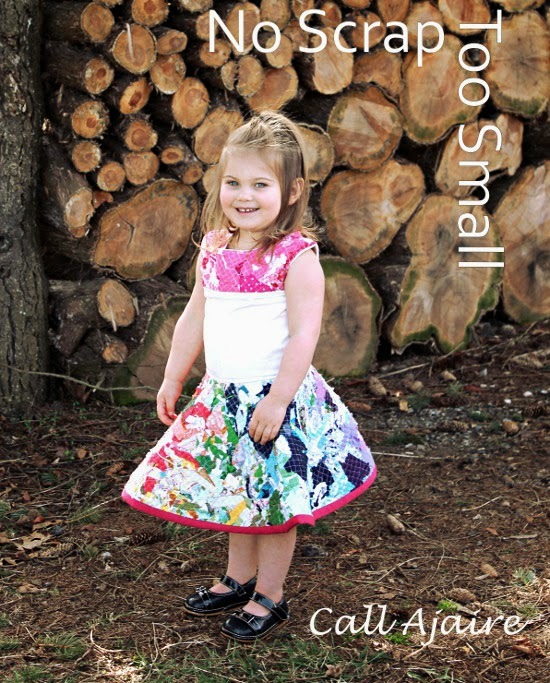 It's incredible how you managed to use even the smallest scraps of fabric! What a wonderful idea!!! Woah! This is incredible. I just found you from the Southern Institute group, and I had no idea you were in Project Run and Play. I haven't kept up with it as much as I have in seasons past, but now I'm gonna have to take a look. Amazing! I came across your blog through Pinterest. I love using every bit of fabric. 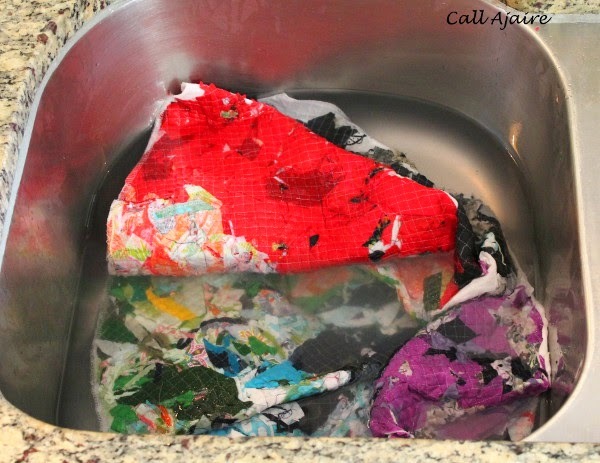 You just gave me a great way to use my scraps. Thank you! Thank you Karen Marie! This was on of my all time favorite projects 🙂 Have fun with it! Simply ingenious. Thank you for sharing this. I'd like to use this process to make a lining for either a Minoru Jacket or Robson coat by Sewaholic! Yes, I think that's the ticket.